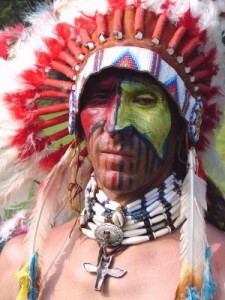 American Indian culture is complex and diverse and many traditions stretch back thousands of years. Until relatively recently, stories of creation and legends were passed through generations by word-of-mouth. Today, American Indian culture remains strong, despite a history of fighting against overwhelming odds. From the Eastern shores to the west, American settlers worked to drive Native Americans from their homelands and build a new, unified country where there was once tribes and clans. Before settlers arrived, the country was a broad mix of cultures, traditions and beliefs. American Indian culture varied greatly, even among neighboring tribes. The Navajo, for instance, have their own story of creation that is far different than the religious beliefs of the Hopi people, who have lived in the same region for generations. Despite the one-sided view of American Indian culture portrayed in movies and books – American Indian culture is actually anything but simple. Important traditions are still practiced today just as they were hundreds, even thousands of years ago. American Indians in the Northeast were among the first to come in contact with European explorers and settlers. In fact, if it were not for the tribes of what is now known as the northeastern United States, the early settlers likely would never have survived the winter. Tribes like the Algonquians were adept at hunting, fishing, planting and storing food for the long winter. In the Southwest, Native Americans learned to survive in an arid, desert climate and built expansive villages and managed to grow and harvest corn in dry, unforgiving environments. As a result, corn came to play an important role in the American Indian culture of the Southwest. Puebloan tribes held the plant sacred and some believed the spirit world had to be pleased to ensure a good harvest and the survival of the tribe. To the Aztecs, keeping the gods appeased meant sacrificing humans, which played a role in their American Indian culture for many generations. American Indian culture is an important part of history as well as the shaping of today’s culture. Copyright © American Indian History and Culture 2019. All Rights Reserved.